A bradycardic rhythm at 36/minute with P’s before each QRS and another P wave following the QRS that does not conduct. 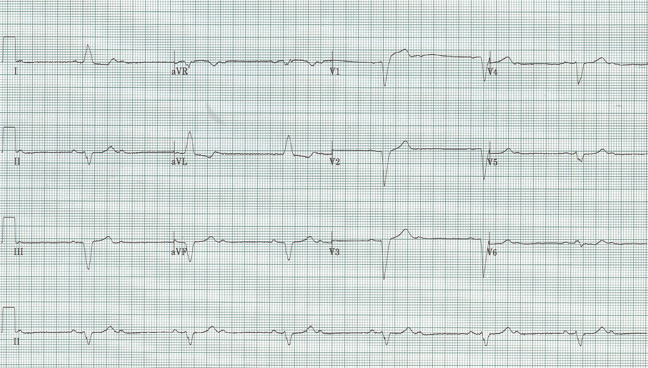 There is also a wide QRS complex consistent with a LBBB. How do you interpret this EKG? 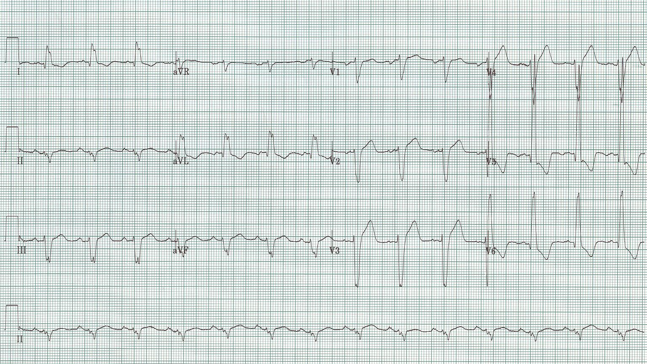 The interesting feature of this EKG is that it nearly meets the criteria and appearance for LBBB. There is a wide QRS, a tall R wave in V6, and some secondary repolarization changes like poor R wave progression and the appearance of ST-segment elevation. What isn’t consistent with LBBB is the presence of small Q waves in V5-6, the “septal Q’s” which indicate early depolarization of the septum by way of the LBBB. This initial, and largely unopposed depolarization wave is left to right, thus small negative waves (Q waves) routinely appear in lateral chest leads, and their appearance assures that the left bundle is present and functioning. 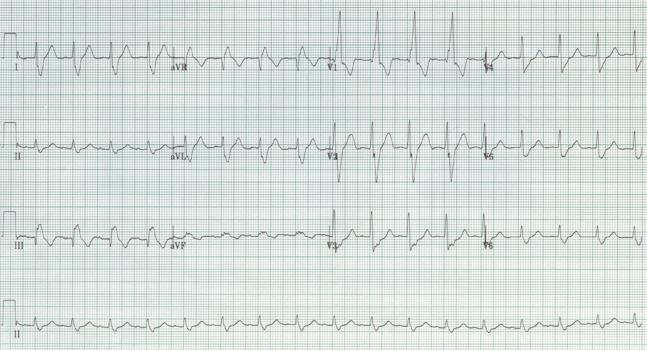 This EKG is severe LVH with voltage criteria and all the secondary changes that begin to accrue – left axis, prolongation of the QRS, repolarization changes in the anterior chest leads. This is one of the most difficult EKG patterns of ST-elevation to differentiate from a STEMI – comparison with an old is helpful and then following the apparent ST-elevation in the anterior leads closely as these repolarization changes are not dynamic and should not evolve as will happen with an acute MI. This pattern is one of the most common causes of “inappropriate” calls to interventional cardiology – often only made clear by repeat EKGs and clinical course. If in doubt, an interventional consult is always the correct answer. Is there chamber enlargement on this EKG? With a RBBB the usual criteria for both right and left ventricular chamber enlargement are somewhat altered. LVH criteria become less sensitive (eg not seen as reliably), but if voltage criteria for LVH are met with a RBBB they are quite specific. In this week’s tracing, the very tall T in V1 is 18mm, and with the right axis deviation is diagnostic of right ventricular hypertrophy.